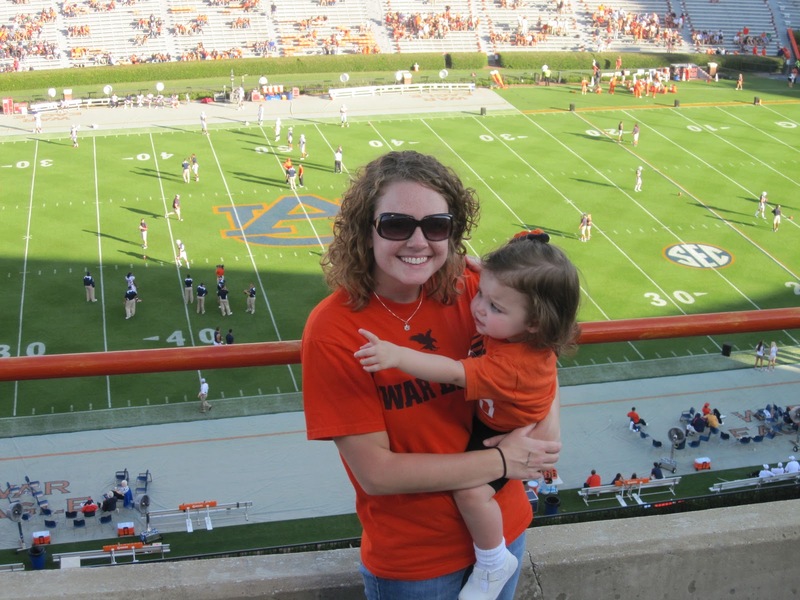 Lily’s first taste of the Auburn game day experience was this past Saturday for the Auburn vs Florida Atlantic game. 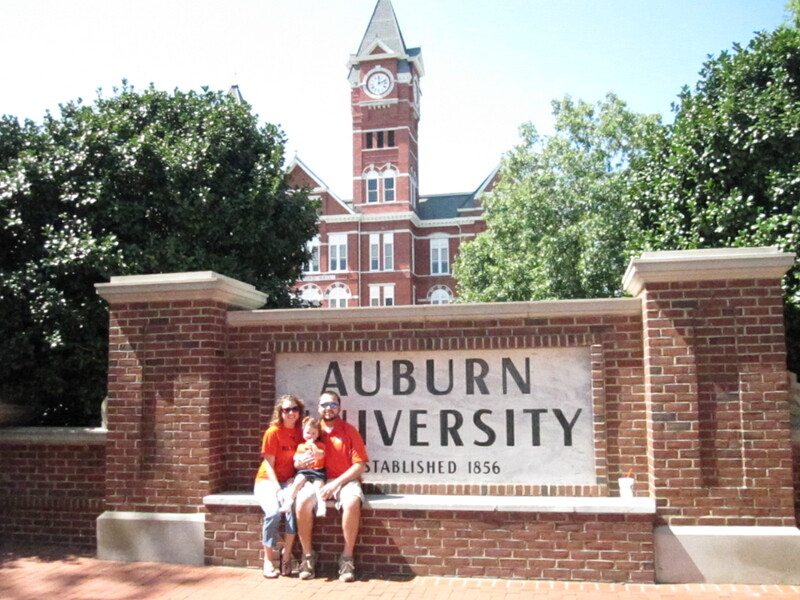 She’s been to Auburn twice before, but it was just to stop for lunch on our way down to and back from Fort Myers Beach last summer. 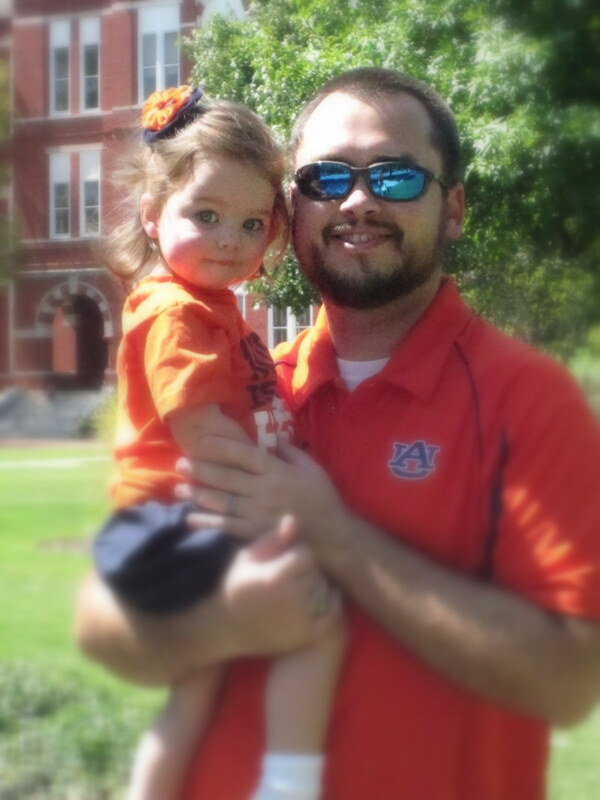 I consider this her first real trip to Auburn since we were able to do things that are unique to the town. 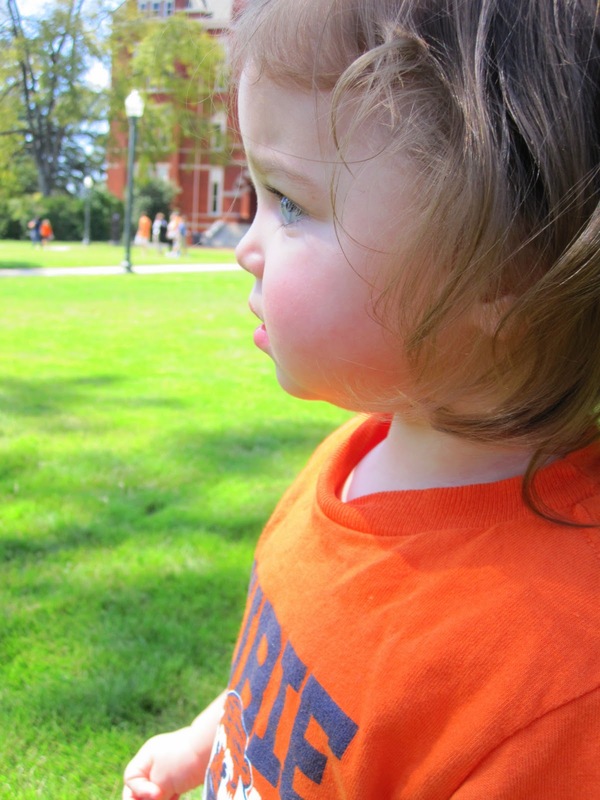 We talked to Lily all week about what to expect, mainly that she would see lots of “aubie” things. 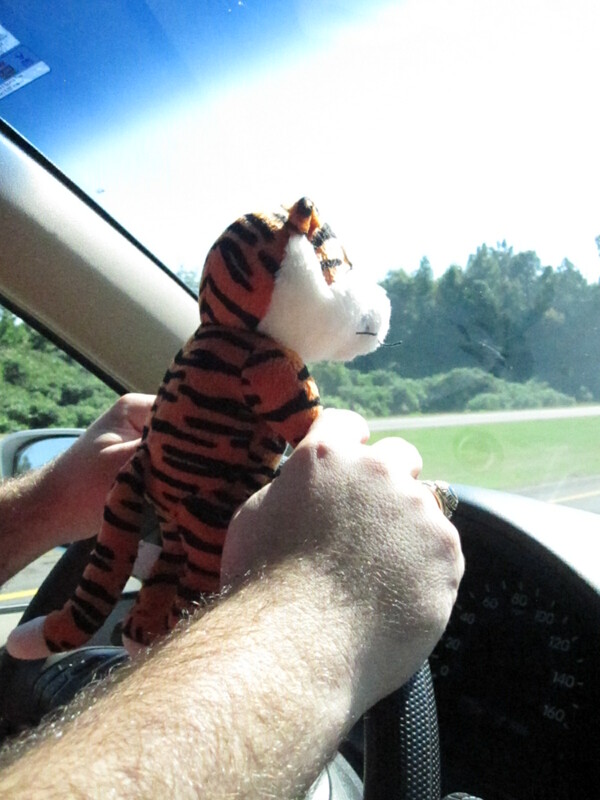 Aubie drove us to Auburn. We got there around lunch time, found a great parking spot since the game didn’t start until 6, and headed straight to Toomer’s to get lemonade. 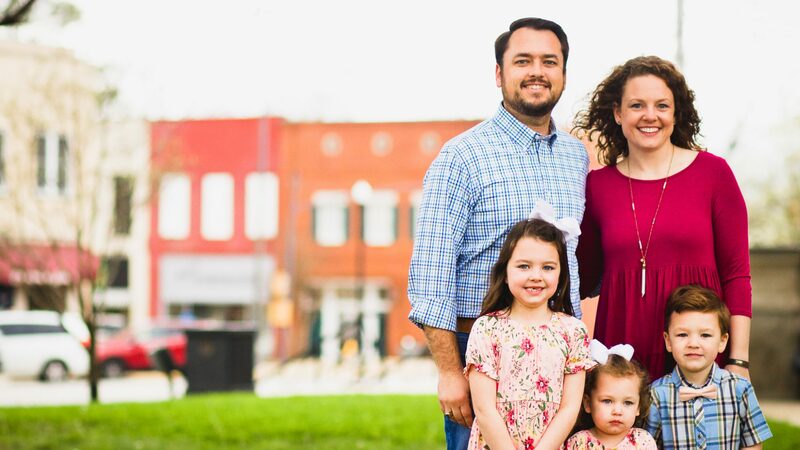 After drinking the world’s best lemonade, we went to Samford lawn to let Lily run around. 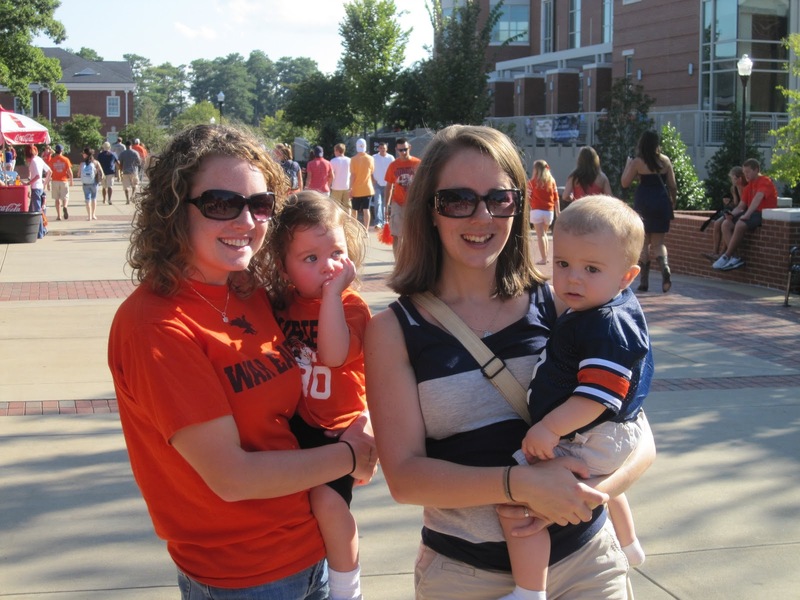 Then, we met some friends (Britt and Katie White) to tailgate for lunch. Lily fell asleep while we were eating, so I don’t have any pictures of us at the tailgate. 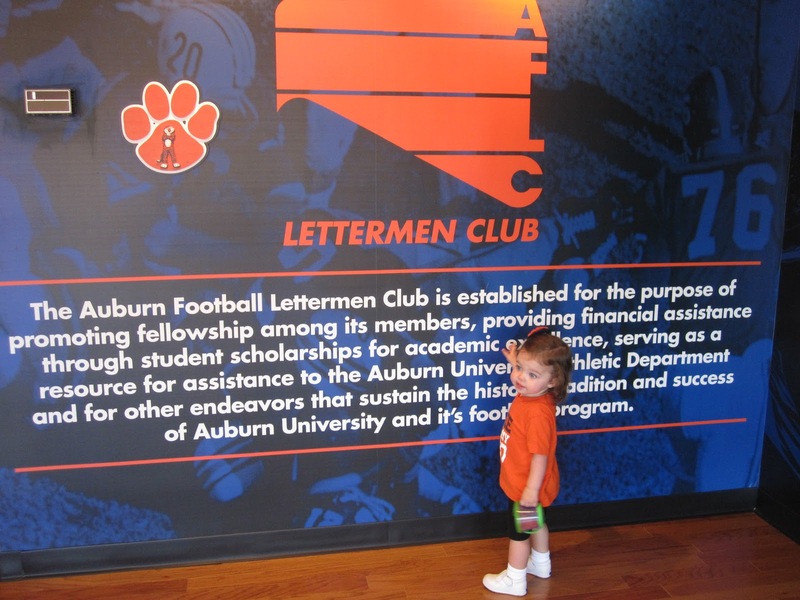 After we ate, Katie’s dad, who used to play for Auburn, took us up to the Lettermen’s Lounge. 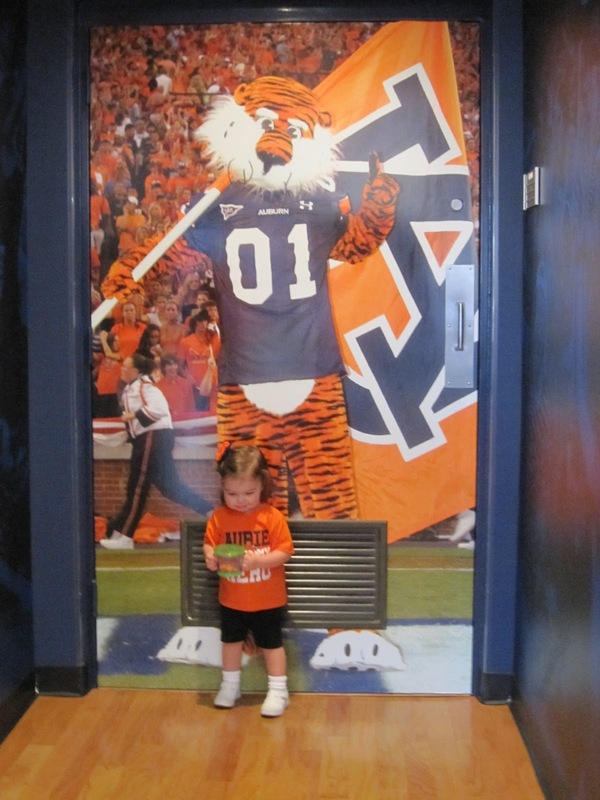 Lily took a picture with Aubie on the women’s bathroom door, just in case we didn’t see the real Aubie. 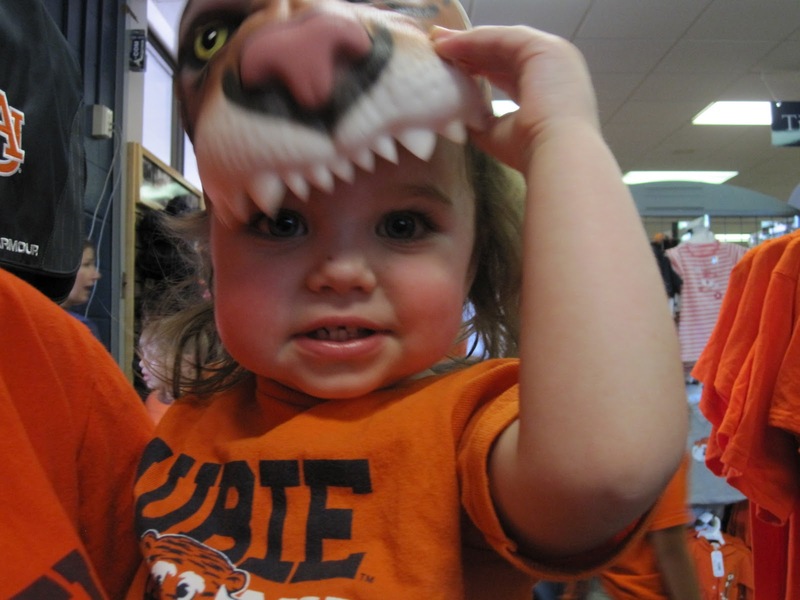 After the lounge, it was time to go on a hunt for Aubie. We were told he would be at the alumni tent at 3. We were there a little before 3 and were able to see him drive up in his ATV. Lily got a good look at him, even touched his paw and made him blush 🙂 Brent was too far away and couldn’t get a picture before he headed into the tent. Lily cried for him like her BFF had just moved to a foreign country and she would never ever ever be able to see him again. It was pitiful. Brent paid $10 for us to be guests of some random person who is a member of the alumni association so that we could get into the tent. It was the best $10 we’ve ever spent. 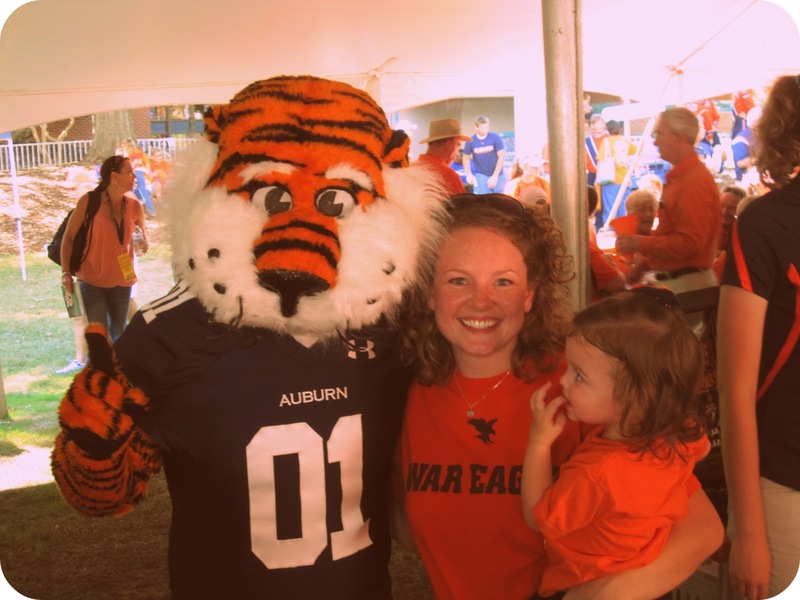 Of course, it would be that as soon as we got in line for a picture with Aubie he walked off to another crowd of people. He’s a very popular tiger! So I put on my Black Friday Attitude and marched right behind him. 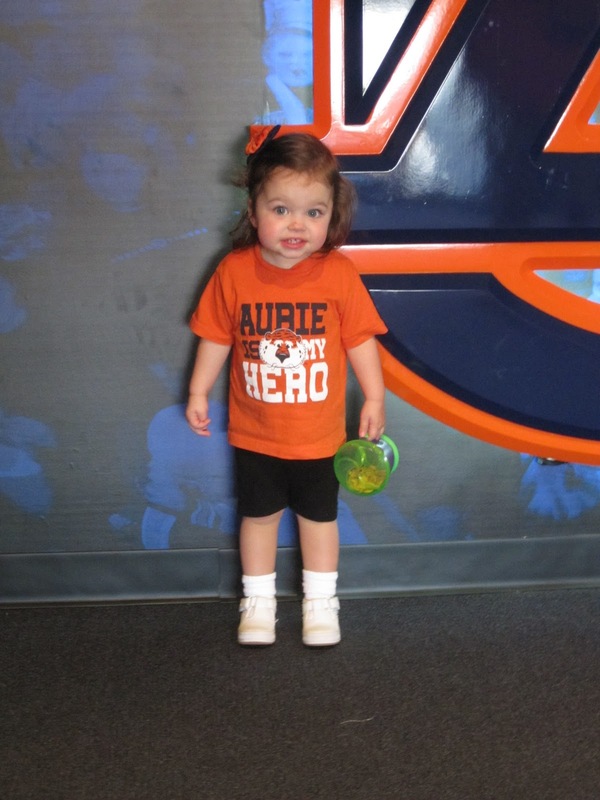 My baby was gonna get a picture with Aubie! I literally just had to stand beside him and ask him several times to take a picture. That poor tiger was being pulled in so many directions and had so many kids begging for his attention, I had to take advantage of the very small opportunity we had to get a picture. Our day could have ended there. Lily was speechless and we were so happy that she got to meet him! We shopped around in J&M and the Haley bookstore and none of us could decide on a souvenir, so we just bought some shakers. Then, we ran into Rebecca, Wesley, and Eli. 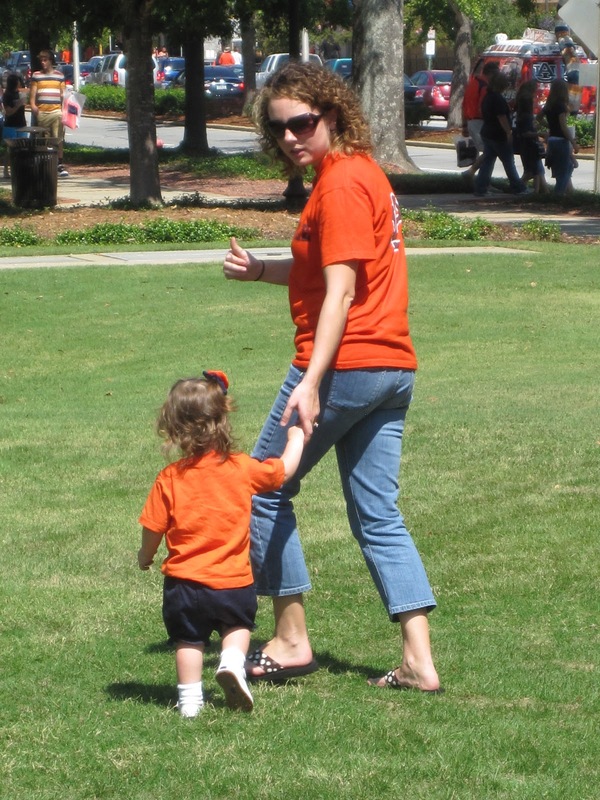 Rebecca is one of my best friends that I met while at Auburn. We were both education majors. This was Lily and Eli’s first time to meet. We made our way to the stadium and got in our seats just in time for the pre-game show. Other than spitting her water on the lady sitting in front of us, Lily did great at the game. She even shared a pretzel with a complete stranger. We left after the half time show. 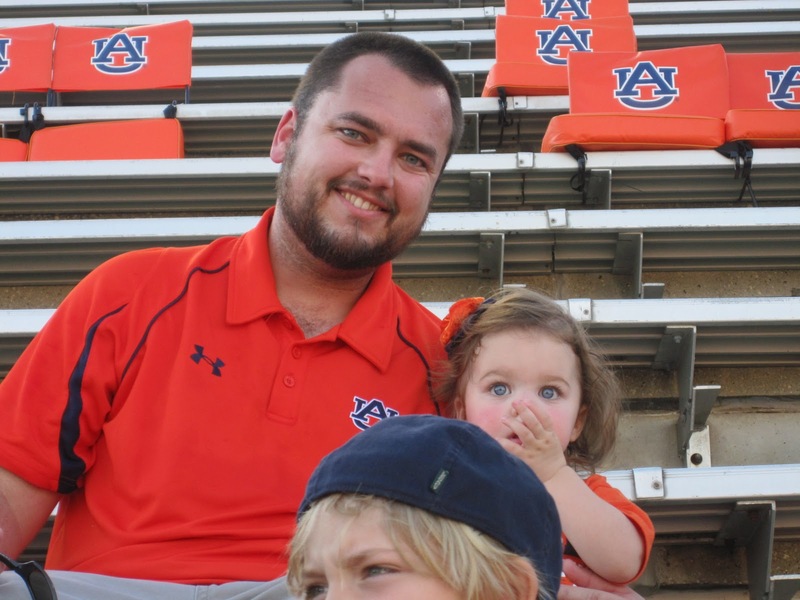 Lily has watched one too many YouTube videos of the AU marching band, so we had to let her watch it live and just like with Aubie, she didn’t blink or make a noise, just watched in amazement. Thanks to my dad (who, by the way, is a HUGE bama fan!) who bought us our tickets and thanks to the Howard’s who gave him a great deal on those tickets! We had a wonderful time and made many family memories. 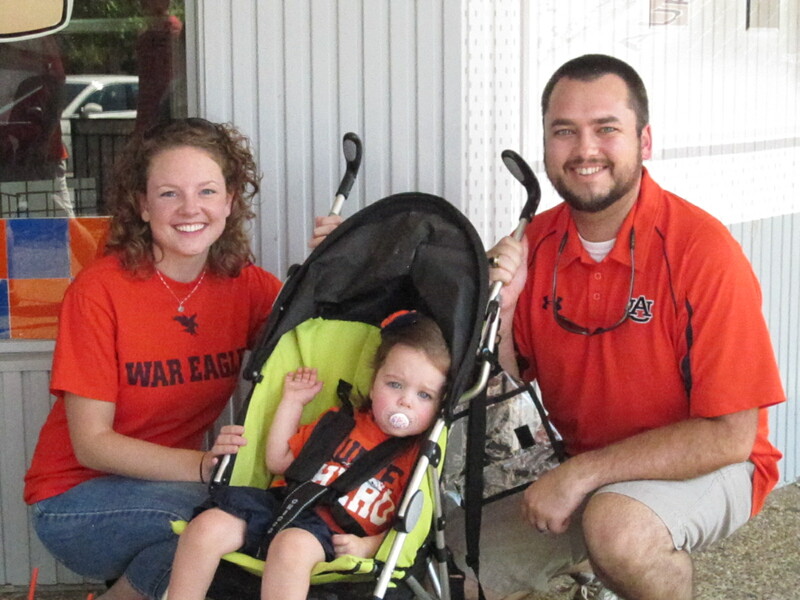 Auburn won 30-14! 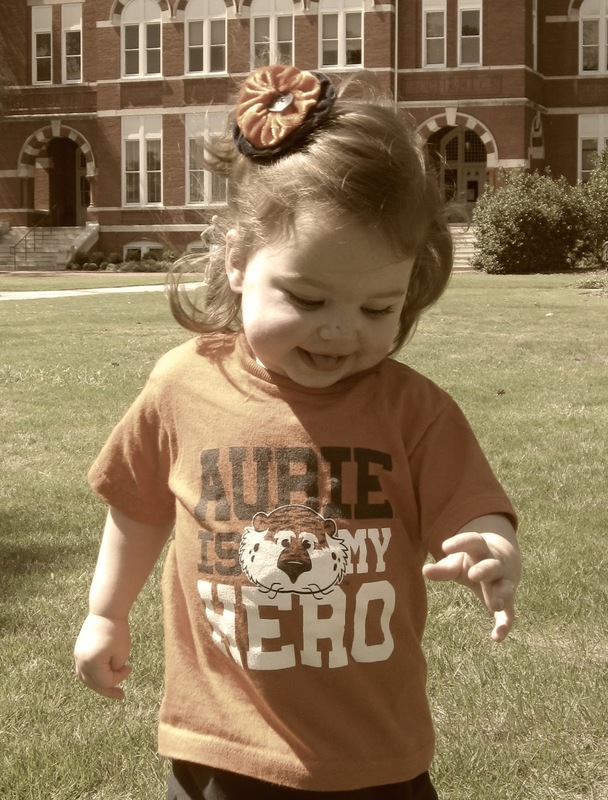 War Eagle!!! What fun! 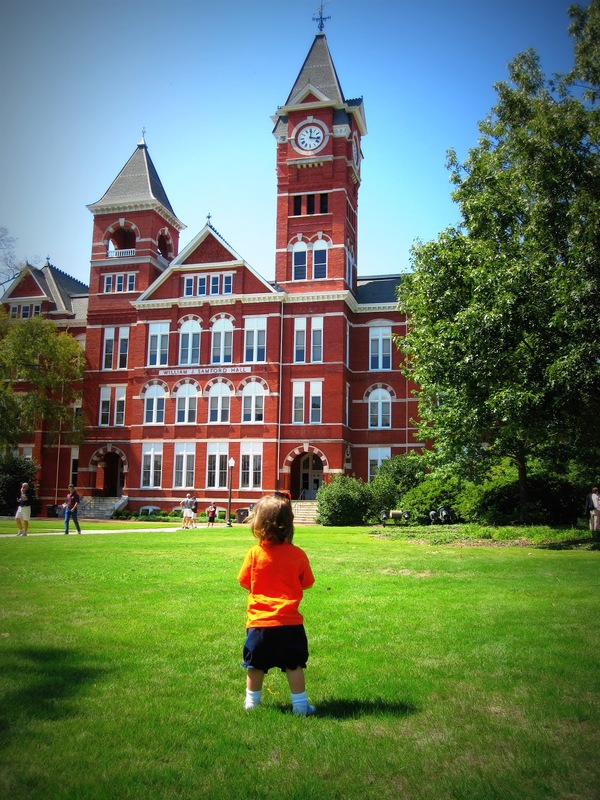 I love the picture of Lily looking at Samford Hall. It looks like she is making plans! 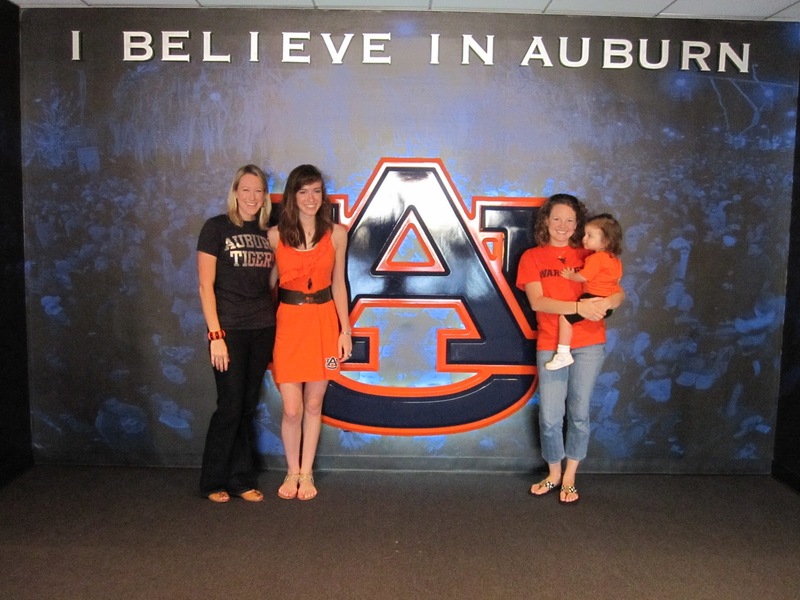 I stumbled upon your blog by searching for a stuffed Aubie online. I have been looking for so long trying to find one that is actually cute. 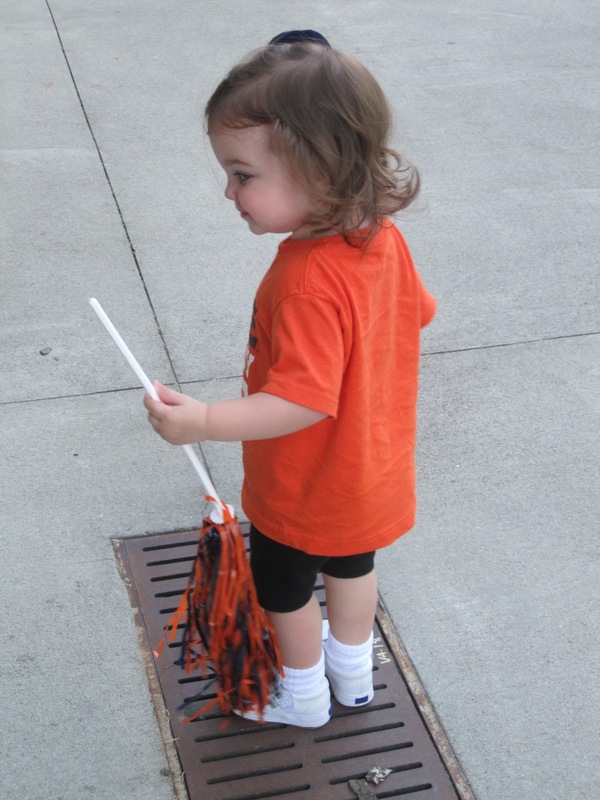 Could you please tell me where you got the Aubie in the post? I know it is from several years ago, so maybe the name on the tag? Thanks for any help!